You deserve lighting that seamlessly blends into your life. 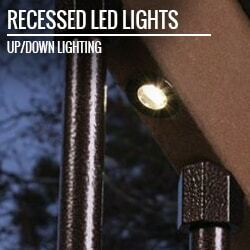 Lighting that aligns perfectly flush with any surface, and withstands any storms, snow, or sun that comes your way. 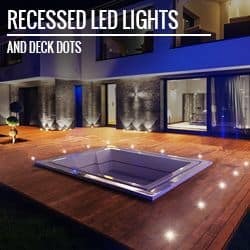 Our collection of LED Recessed Lighting and Deck Dots™ does all that and more. 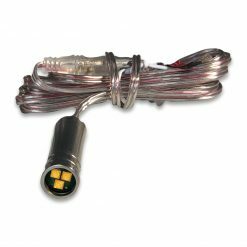 With every complete LED recessed lighting kit, the EZ Photocell Timer is included. 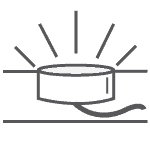 Allowing you to time, schedule, and activate your lighting system, you have complete control over your light.  Helping you save energy and cut down on electric bills, our lighting control gives you the power to command your lighting. 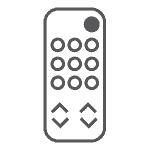 But, if you want added innovation, our EZ Wifi Remote and App allows you to adjust your recessed lighting right from your phone using the DEKOR® app. And, our EZ Motion Controller+ and PIR Sensor is motion-activated, using a remote control to designate zones of lighting, set motion-activation, and adjust dimming and sensivity. DEKOR® Lighting is proud to welcome the Mini Soffit LED Light to our best-selling collection of recessed lighting. 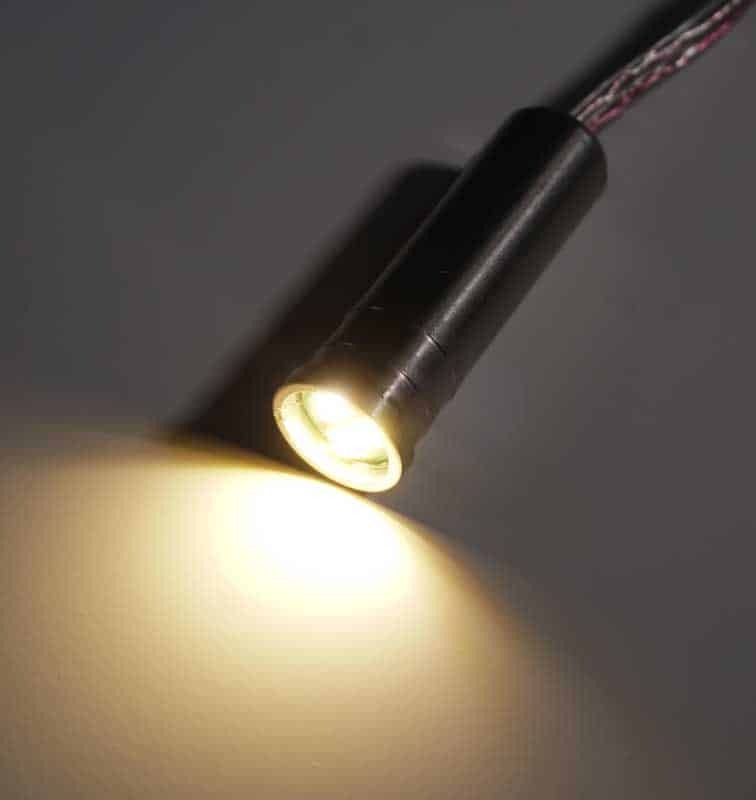 With a compact component that amps up the shine, our new Soffit LED Light series promises to deliver our smallest, brightest, and most versatile light yet. Made of modern and mighty stainless steel housing, this low-profile soffit lighting component enables you to find recessed lighting that will stand strong through it all. 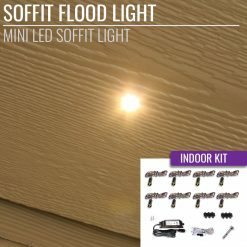 From drill installation through drywall to vigorous snowstorms and yearly humidity waves, your new Mini Soffit LED Lights will stay sparkling through it all. 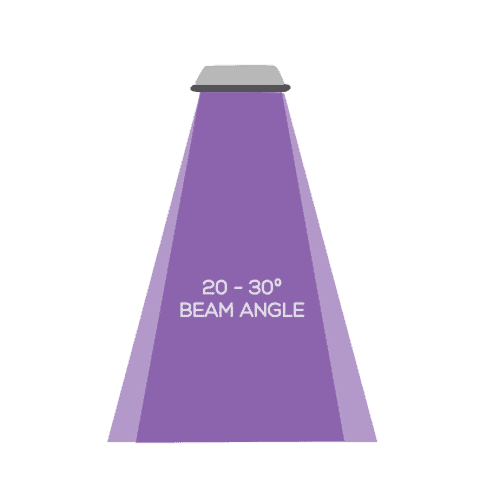 Measuring a mere 2” long by 1/2” wide, our new soffit light is nearly undetectable by day. But, don’t let this small sizing fool you—our newest recessed light packs on the luminosity with the brightest Cree LEDs on the market. 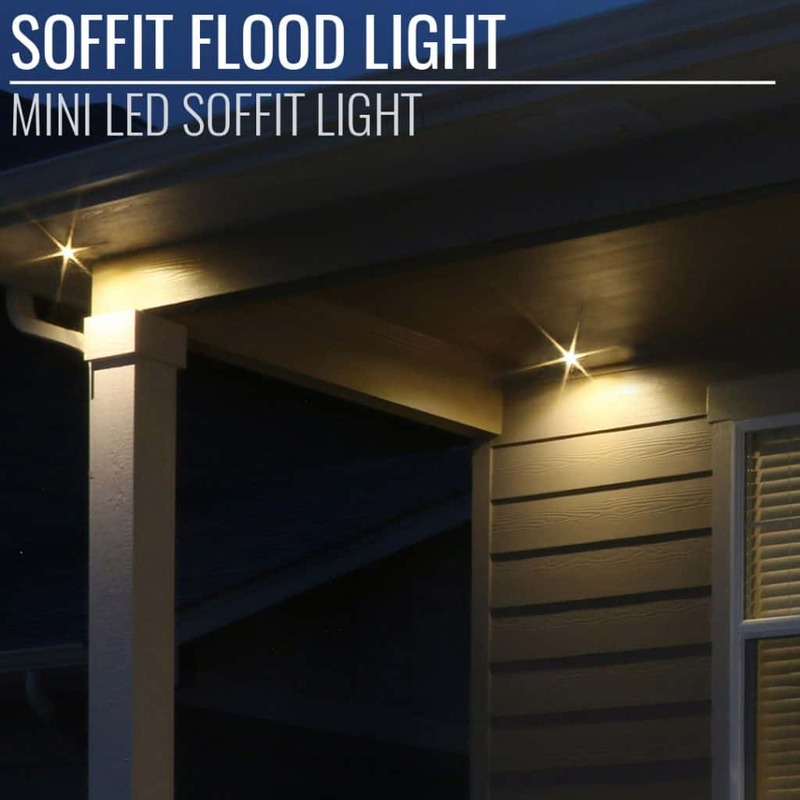 If you’re tired of your home losing its life in the dark of night, make it shine with DEKOR® Mini Soffit LED Lights. 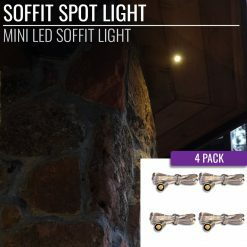 Available in a Flood or Spot Light beam, these lights can be used to focus and highlight various elements of your home, or add subtle accent lighting and soft glow throughout. 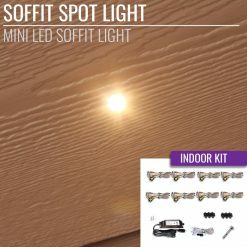 Choose from our versatile package options, with the Soffit Flood and Spot Light available in 4 Packs, Indoor Kits, Outdoor Kits, and sold individually. 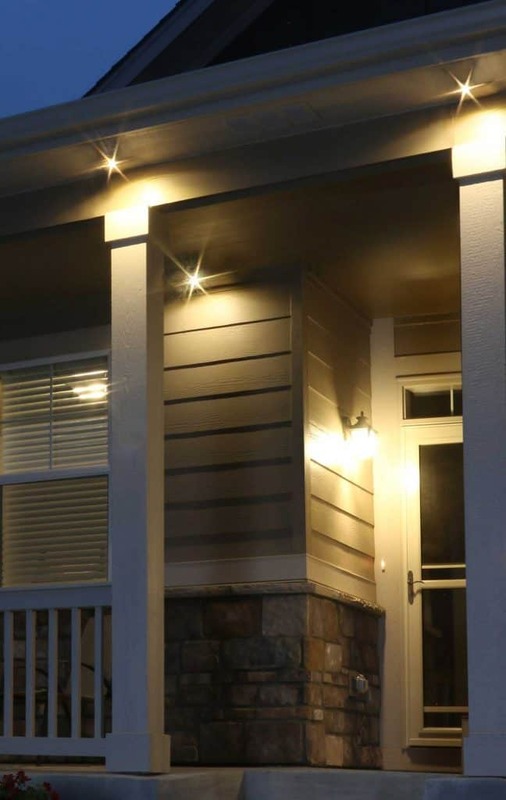 Our second generation of low-voltage 12VDC LED recessed lighting introduced Deck Dots™ to the DEKOR® lineup.Fusing together the ease of simple installation, flush alignment, virtually undetectable housing, and green LED technology, Recessed LED Deck Dots™ were born. 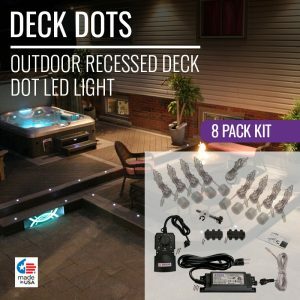 In the Deck Dot™ kit, you’ll receive 8 individual light components, each with 4 eco-friendly Cree LEDS. 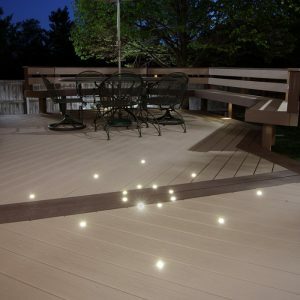 Casting a white glow across your deck, your home will be illuminated with a radiant light that will last for years to come. 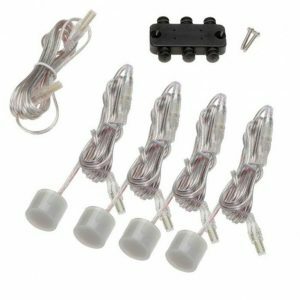 Your kit also includes our EZ dimmer, which allows you to adjust the brightness of your decking lights with ease. 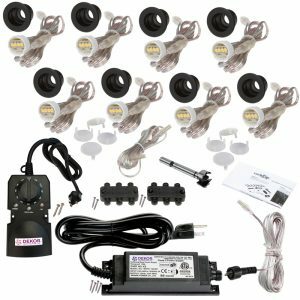 And if you need more than just 8 lights to complete your deck, you can find expansion packs of 4 lights on our site to extend your lighting experience. 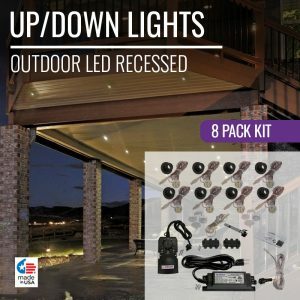 What sets Deck Dots™ apart from our other LED deck lights is its transparent polycarbonate cover, which allows it to blend into any deck undetected. This little cover isn’t just for show, though, as it is tougher than the strongest aluminum on the market, pound for pound. Deck Dots™ can be installed with our easy step-by-step instructions, breaking down the installation process for you. And, if you ever have any questions or concerns, DEKOR® is here to help. Call our customer service line to get the answers you need from real people you can trust. 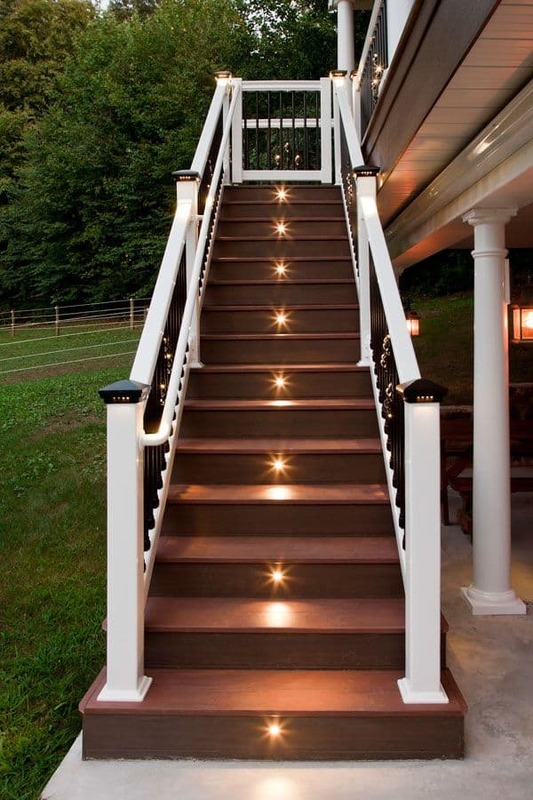 The DEKOR® collection of outdoor LED recessed stair lights enables you to illuminate your exterior and indoor steps and stairs, increasing safety and adding ambiance. 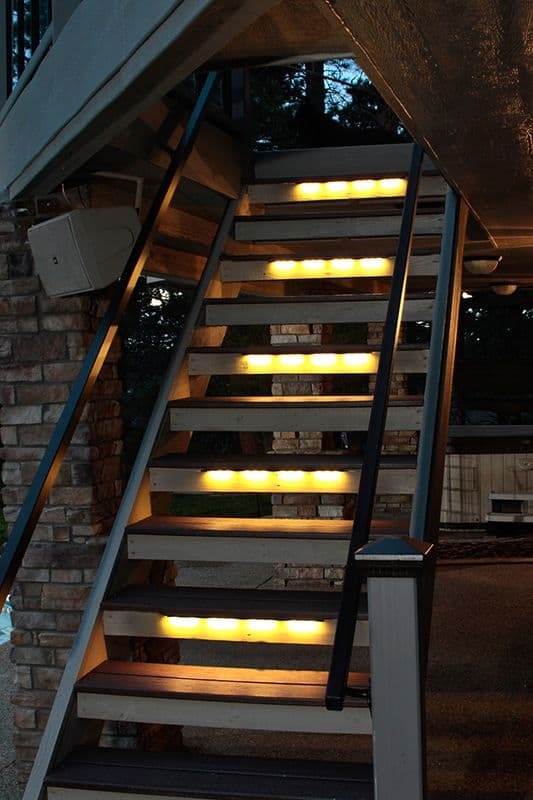 Casting a 30° angle of light upon your stairs, your home will light up with a stunning glow that serves a vital purpose of delivering visibility and direction as you walk up the stairs. 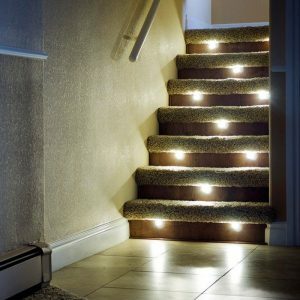 And, you can adjust the direction of the recessed lighting angle by simply turning the housing, creating customized lighting for any set of stairs. 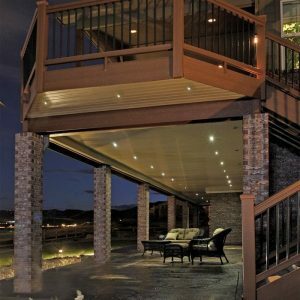 If you’re looking for soffit lighting, simply flip the housing upside down to set up under-deck lighting. 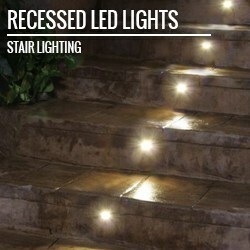 Ideal for patio steps, deck, docks, and embedding into concrete, our collection of LED recessed lighting for stairs is multidimensional. Offered in 7 powder-coated metal shades ranging from hammered white to black gold, you can make your stair lighting integrate effortlessly into your home’s style. 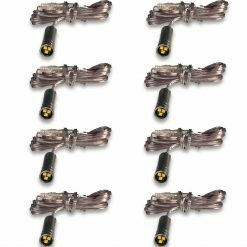 Included in every kit is a powerful EZ 36W transformer which lights up 30 Individual LEDS. 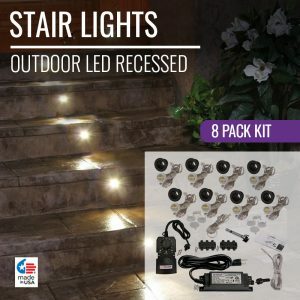 Also included is our customizable EZ Photocell Timer, which allows you to schedule, time, and activate your lighting with the turn of a dial.Our recessed stair lighting is available in a full kit and expansion packs of 4 lights. If you want your lighting to seemingly appear from nowhere, remaining hidden from sight while still shining bright, our No See Em LED Light Strips are your solution. Only a mere 5/16” high, No See Em Strips are intelligently designed to disguise their source of light. Each No See Em light is entirely waterproof and built for the toughest environments. Although these lightweight strips seem delicate, they are abundantly strong and durable, enduring the elements with ease. 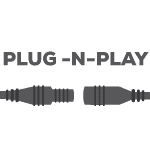 Every light strip is embedded with Cree LEDS and housed in a powder-coated aluminum strip, made through a cross-sectional extrusion process that melds the metal with the lighting. 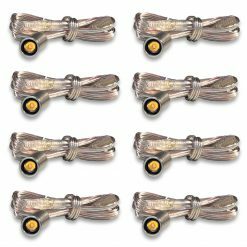 No See Em LED strips are ideal for illuminating under stair treads, cap stones, deck railings, or even lighting up a truck bed. 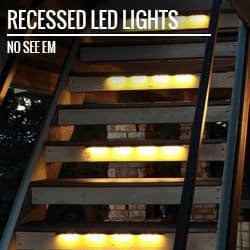 If you’re looking for low profile lighting that stands out while concealing hardware, our No See Em LED Lights Strips are made for you. 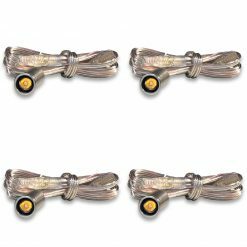 Each No See Em strip is 20 1/4″ in length, 1/2″ wide and only 5/16″ high (20.25″x.5″x .3125). 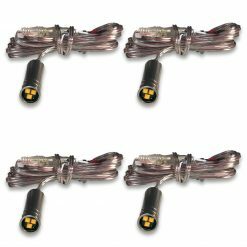 The No See Em LED Light Strip kit includes 4 strips and 36 watt EZ waterproof transformer that supports up to 24 lights. And, an EZ Photocell Timer is included in every pack, allowing you to dim and time your No See Em strips, helping you save time, money, and energy. 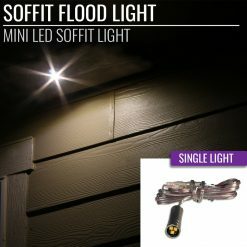 If you want to make your home shine all the way from the street, our newest collection of Mini LED Soffit Lighting is the way to glow. 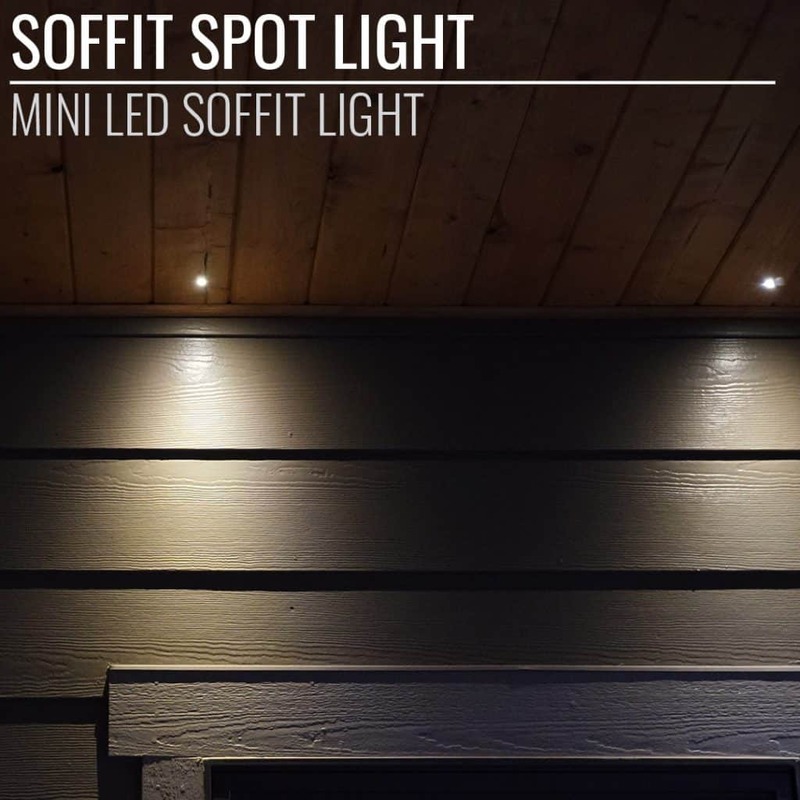 Featuring our smallest recessed lighting component ever at 2” x 1/2”, the new Mini Soffit Light allows you to seamlessly incorporate standout lighting without obstructing your home’s natural silhouette and design. Whether you’re looking to light up your home’s patio with cascading recessed lighting, or you want to add a sleek shine to your newly remodeled kitchen and living room, DEKOR®’s newest compact LED soffit lighting can do it all. 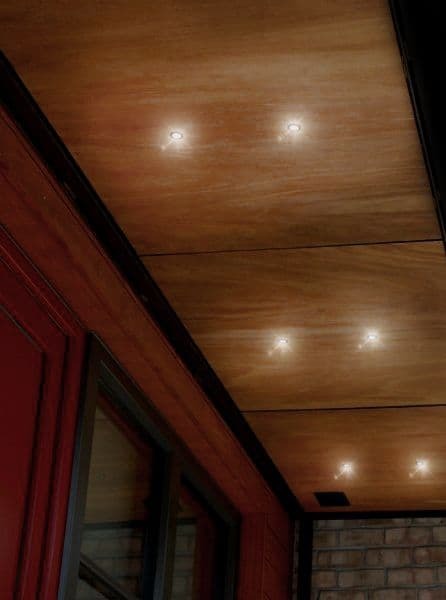 Infuse polish and sophistication to your home’s entryway, incorporate much-needed visibility to your deck, or even add a splash of shine to your master bath—with the new Mini Soffit Light in our recessed lighting collection, the sky’s the limit. 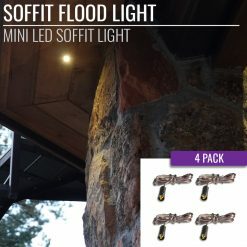 Our new soffit lighting series is available in 2 distinct lighting effects: the Flood Soffit Light, which produces a wide beam of light at 120°, and the Spot Soffit Light, which produces a concentrated beam at 20-30°.